I was heading south to London by rail, and had time for a diversion (off the East Coast Main Line at Grantham). 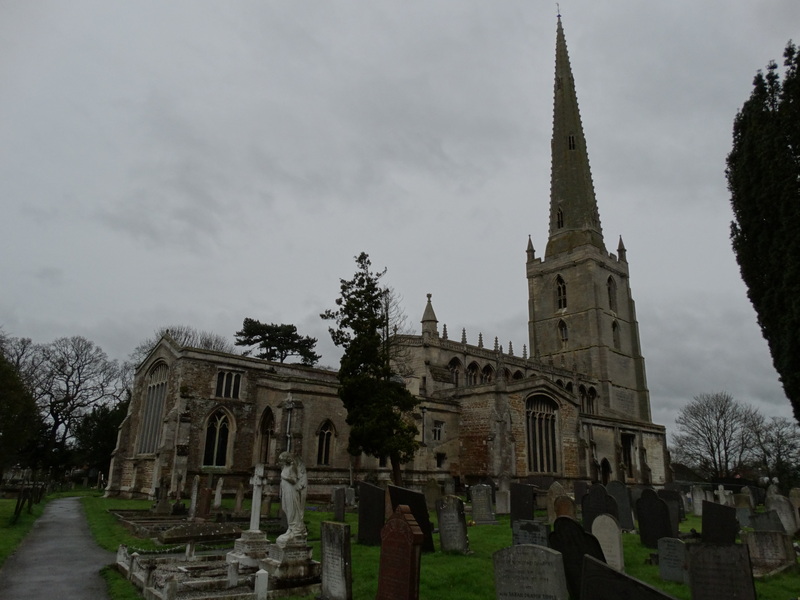 If I had visited by car, Bottesford is not far off the A1. The church is a lovely walk from the station. I knew it was a Grade 1 listed building, but I had not realised how stunning the church would be – this is going to be a long, long blog. I found a very busy church. They have had major renovation work, a new pavement floor, new kitchen and a moved font. It will be gorgeous when finished and give all sort of other opportunities. I had a chat with some of them, and shared their coffee. 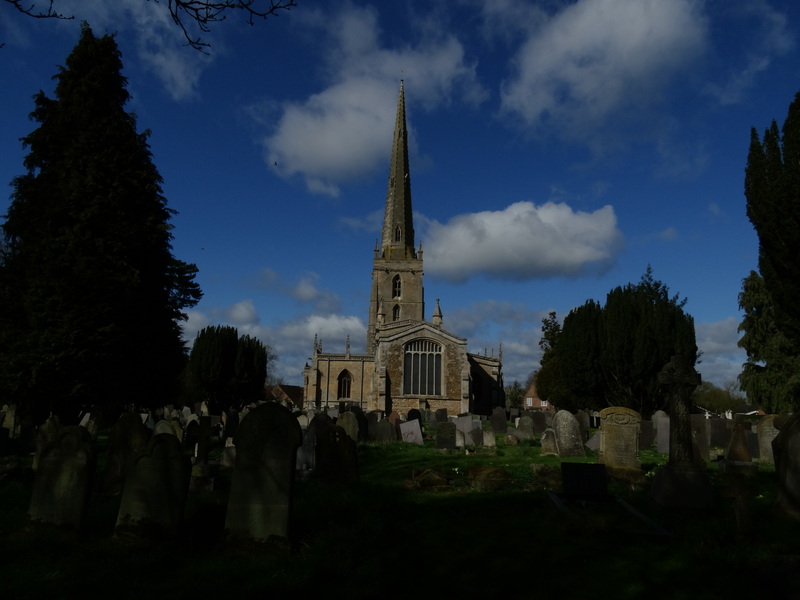 I had a good long walk round with camera and guidebook – and was very glad to have visited. Here are photos stood by the door, looking west and east. 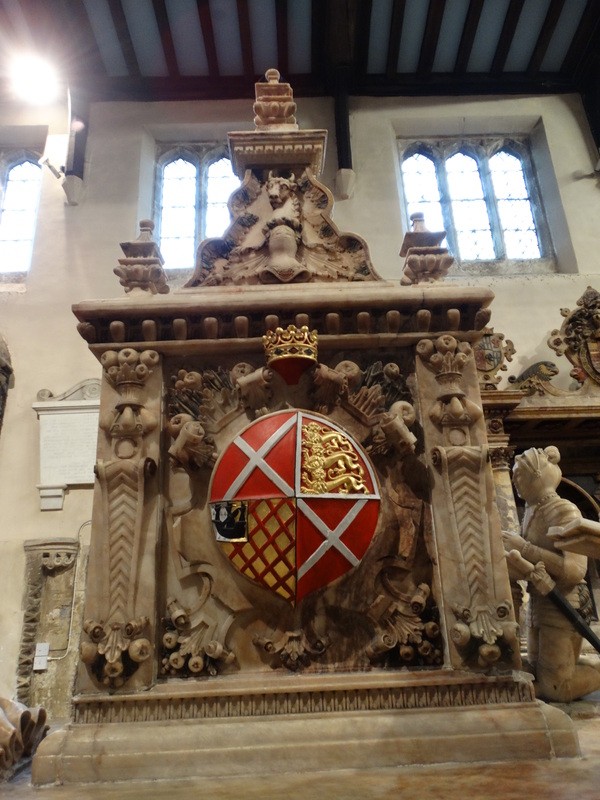 Many of the hatchments were covered in plastic, there are two which weren’t – they remember members of the Manners family. Time for some local history. Just down the road is Belvoir Castle, one of those places on my list to go. There was a Saxon church on this site, and you can still see remains of the C12 church. 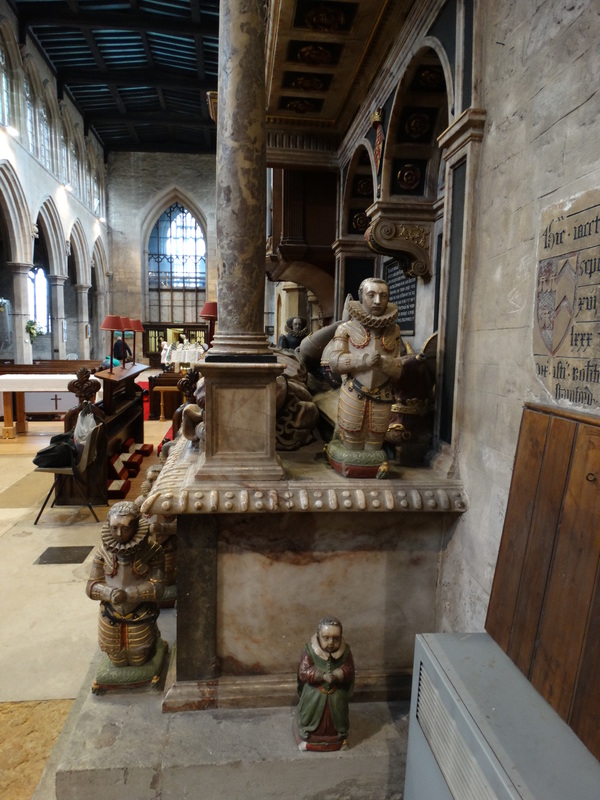 In the C12 the Lords of Belvoir In the mid-C13 the de Roos family from Helmsley took over. 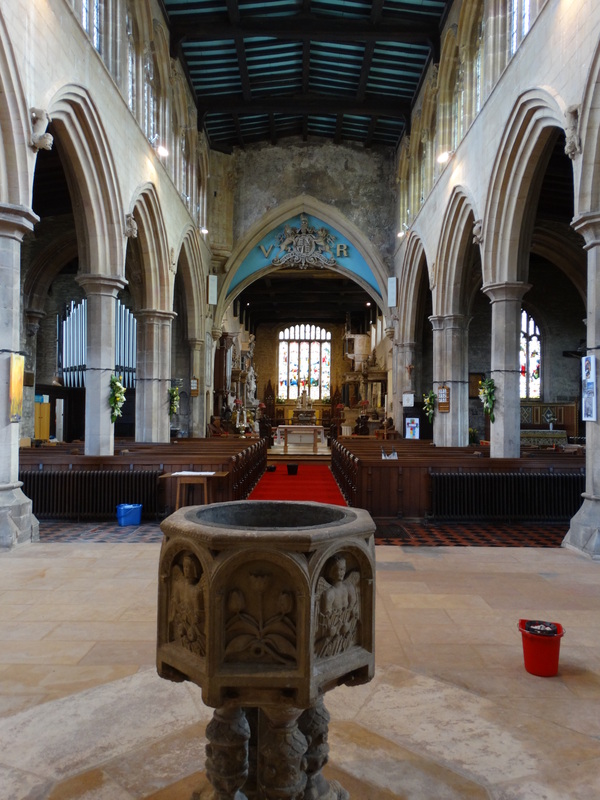 In the early C14 St Mary’s was rebuilt and greatly enlarged – the original nave became the chancel, and a new nave and transepts were added. 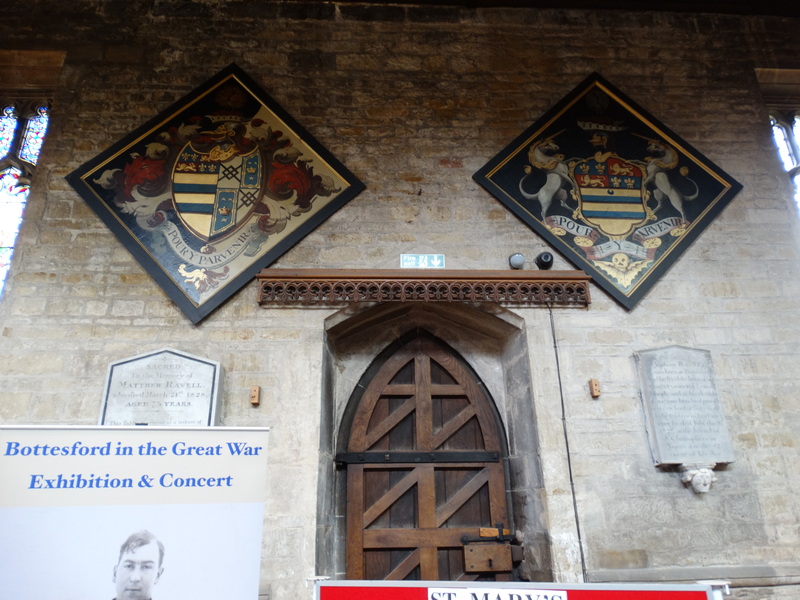 A century later the Perpendicular nave, south transept, aisles, clerestory, tower, spires and windows were added – that must have cost a lot of money. 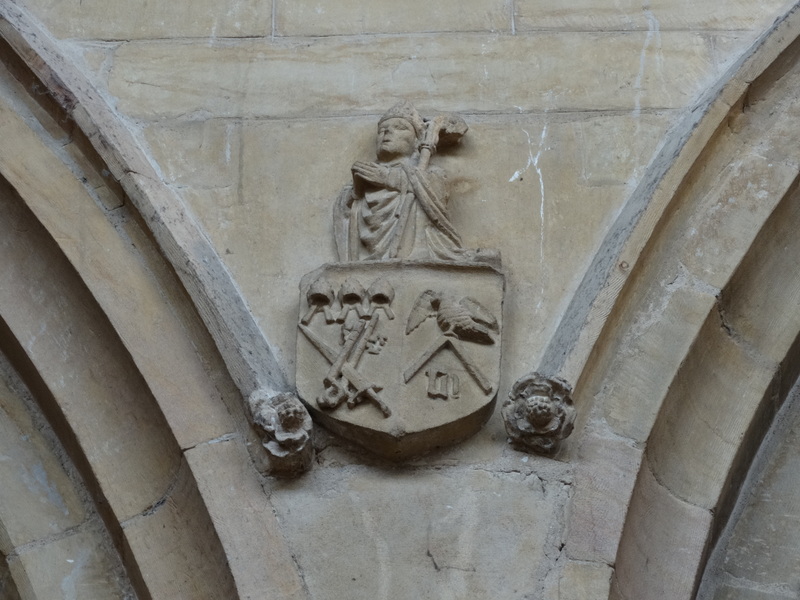 The de Roos supported the Lancastrian kings in the War of the Roses, and Thomas Lord Roos was beheaded by the supporters of Edward IV in 1464 after the battle of Hexham. Belvoir passed to the Manners family in 1508 – ah, we’re back to the Manners. Be patient – there is more to come. 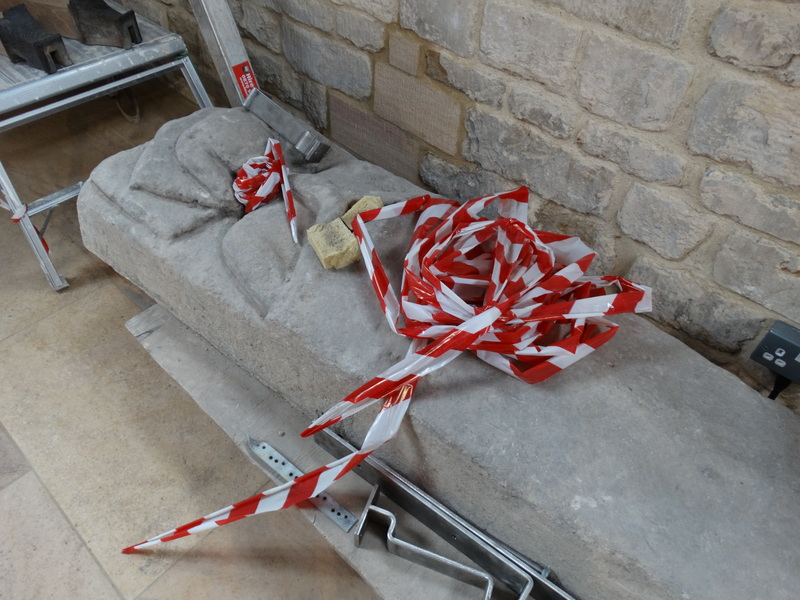 Here, and why didn’t I remove the tape?, is the Fair Maid of Normanton. 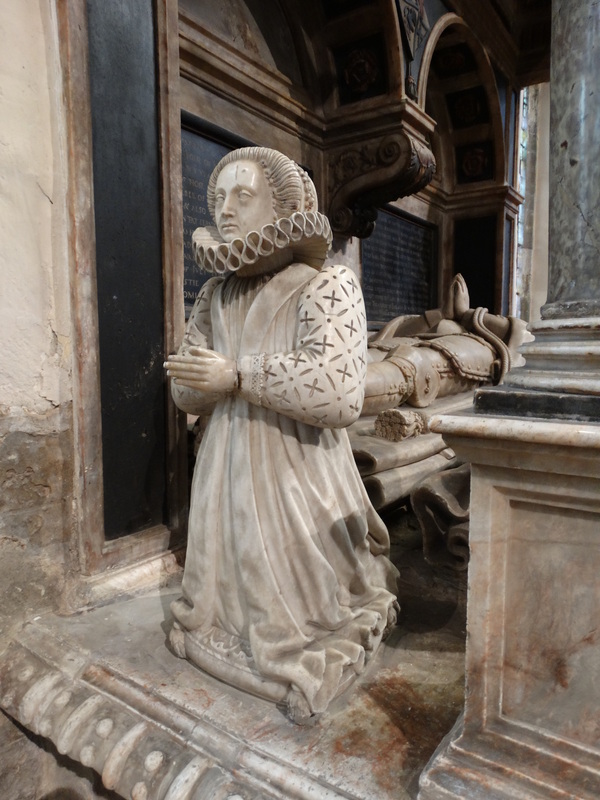 Traditionally she is a flighty (to quote the guidebook) member of the Belvoir family – so flighty that successive Dukes refused to let her in the church. There are other suggestions, but I like the idea of a stone flighty woman. The font is quite wonderful. 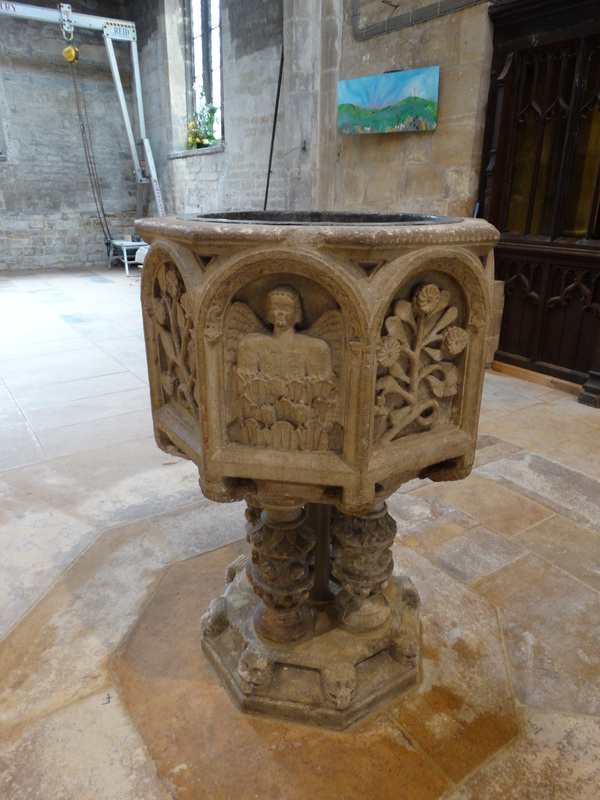 It is an octagonal C15 font, and is supported by ornate bulbous Tudor legs upon a C13 or C14 base. As part of the current work, they have put a new metal support in. This is a piece of work they should be well-proud of, I can imagine the hours of discussion there must have been before this was deemed acceptable. 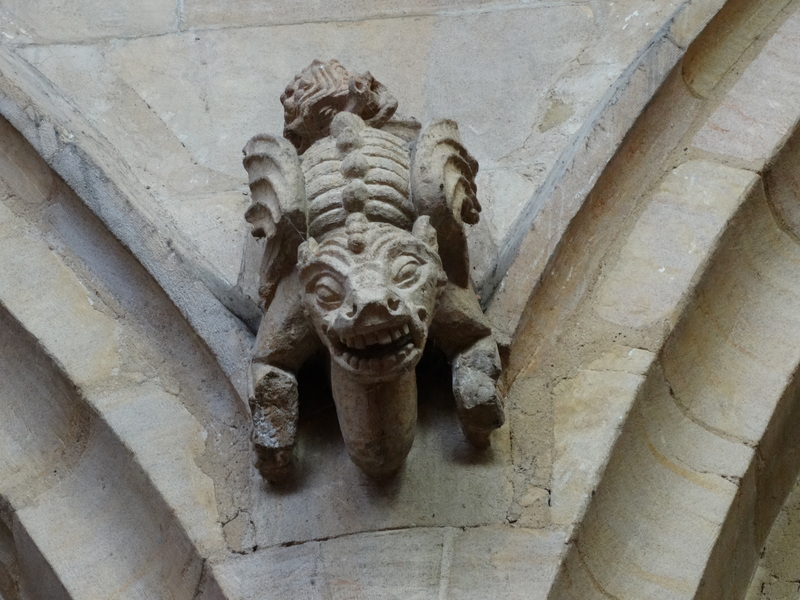 In the Nave there are some wonderful carvings. Enjoy these figures! 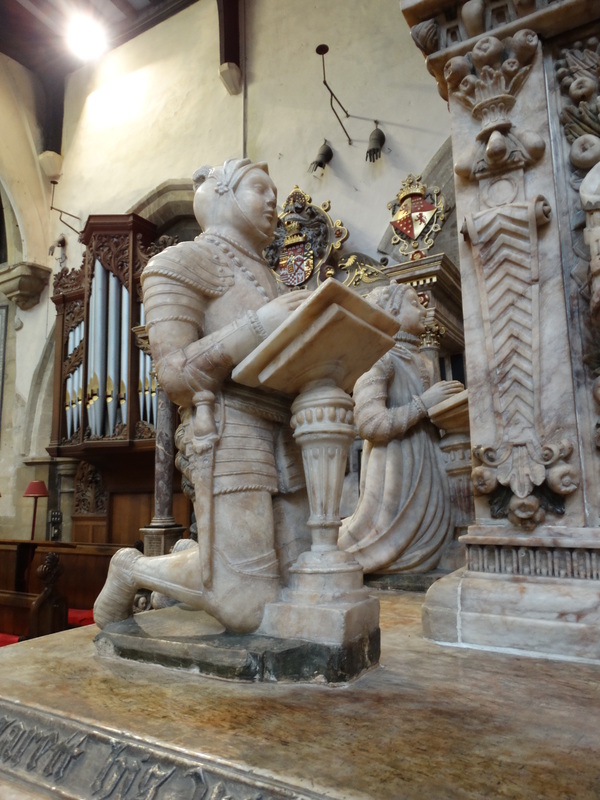 They have done an excellent job of installing a platform and a nave altar – note the ramp on the north side – and I have finally solved my “what do we do with the chancel problem” (see my northernvicar post on Hartburn), the answer is to fill your chancel with tombs! 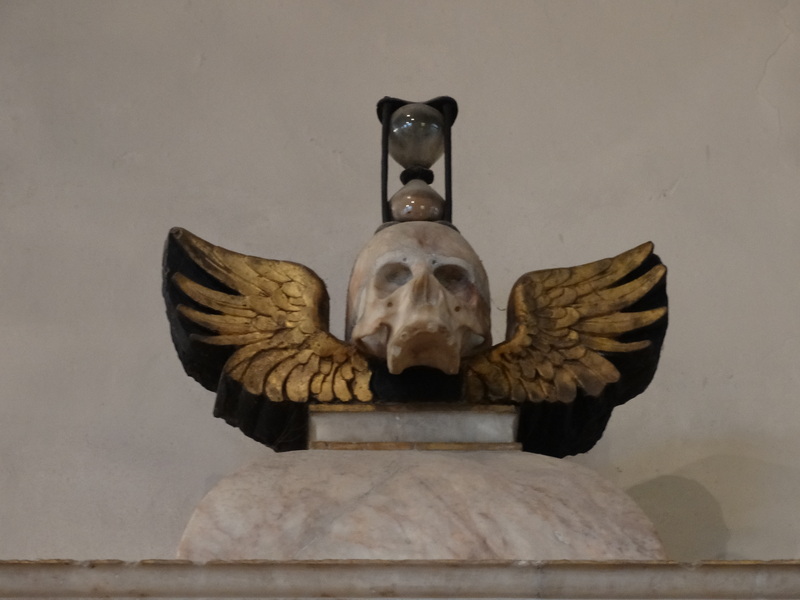 I hope my readers are feeling patient – there are lots of lovely tombs. The first one, and you will have the text followed by the photos, is this one. Robert de Roos, 1st Baron de Ros, 1285 – a knight wearing a hooded haubeck of chain mail under a loose sleeveless surcoat, mail gauntlets, a sword, belt and shield. 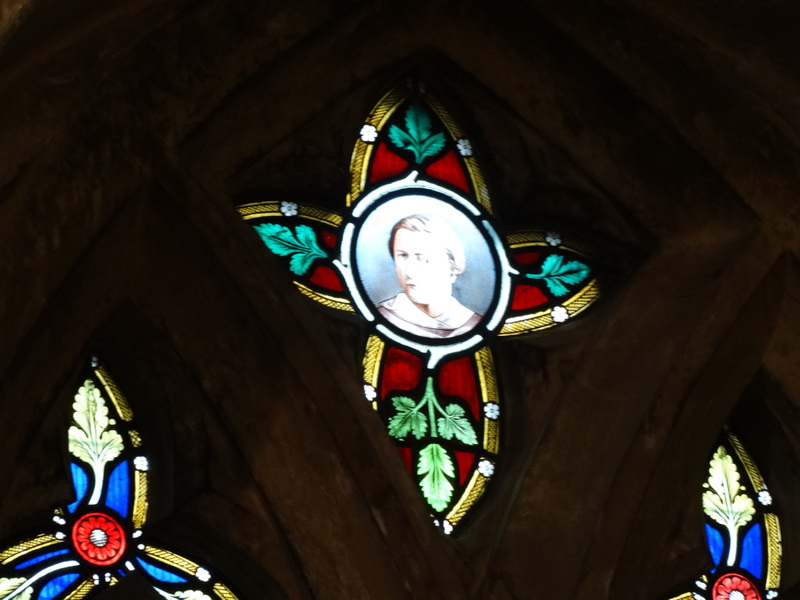 He’s inside the altar rail on the north side of the Chancel. 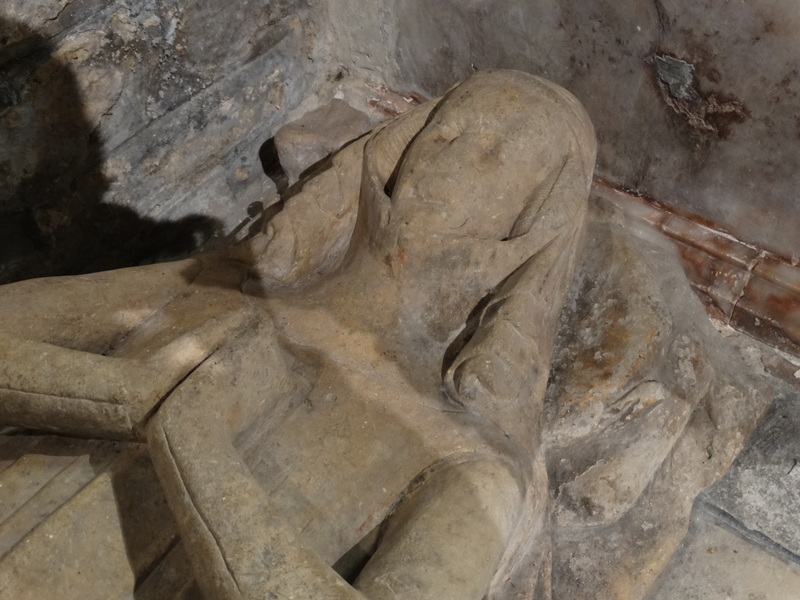 This woman was brought from Belvoir Priory after the Dissolution – the dress suggests a date about 1310, so she could be Maud (or Matilda) de Vaux, wife of William 2nd Baron de Roos. The guidebook tells me “Her wimple is worn gorget wise protecting the neck and chin … her braided hair is circled by a fillet”. You have, of course, noticed all this from the photo below! 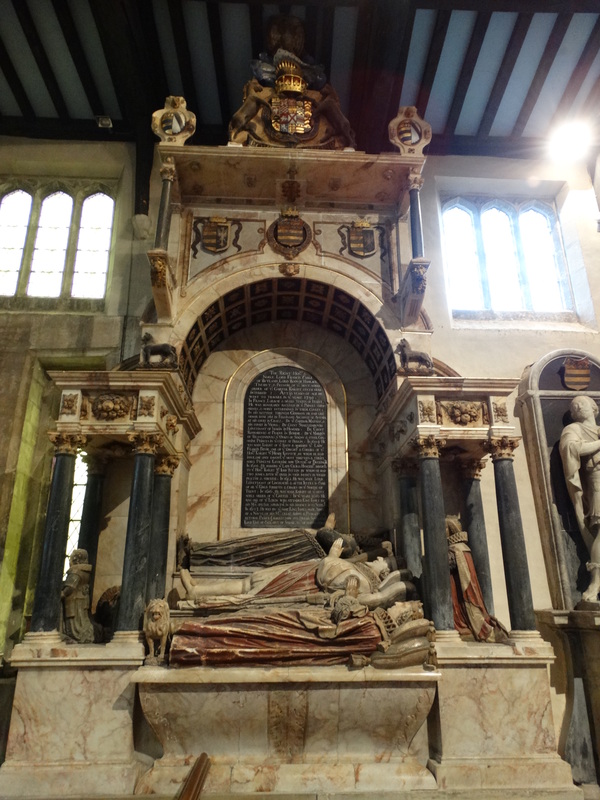 On the north side of the altar (so I couldn’t really climb into the sanctuary to photo it) is the alabaster tomb of John, 8th Baron de Roos, died 1421. This also came from Belvoir. 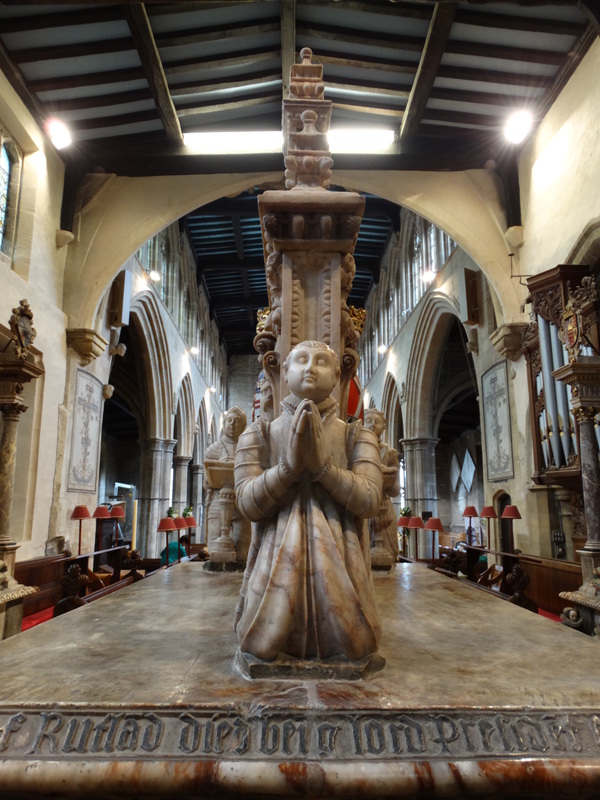 It makes you wonder how you move something like this – Priory being dissolved, but you still manage to move the family tombs (without a crane and low loader). This good gentleman had fought at Agincourt, and was killed at Beaugé. 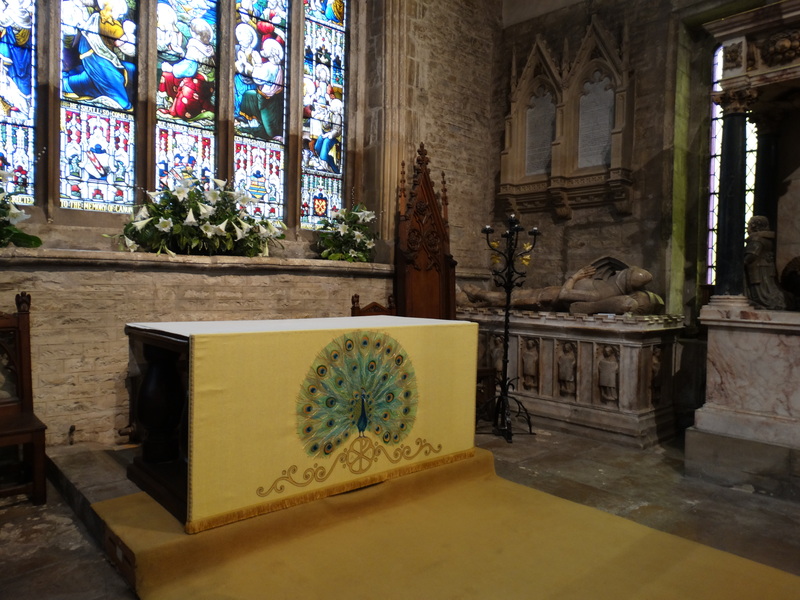 This is also a stunning altar frontal. This tomb is the first of the “in situ” burials, in other words they happened after the Dissolution. 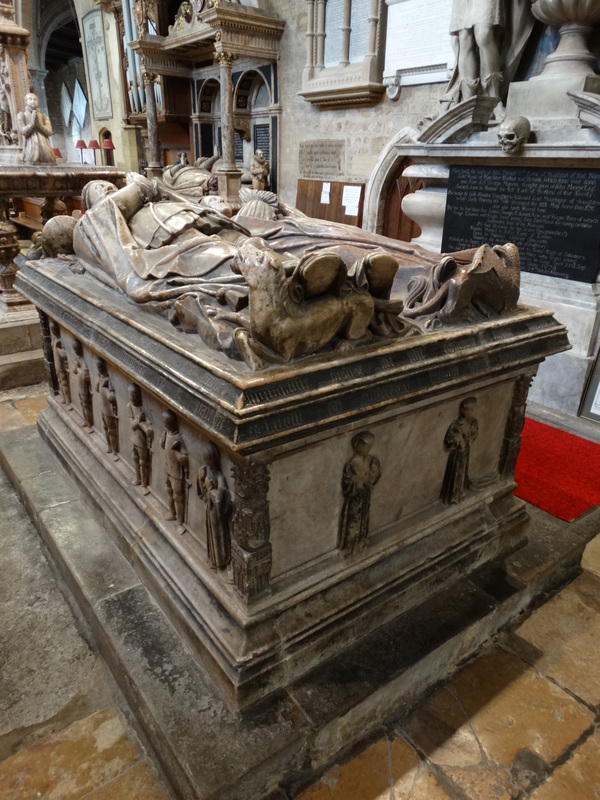 Thomas Manners, 1st Earl of Rutland, died 1543, and Countess Eleanor, died 1551. He is dressed in mail and full plate armour, wears the mantle of the Order of the Garter, and the garter itself is on his left leg. His feet rest on a unicorn (minus horn). 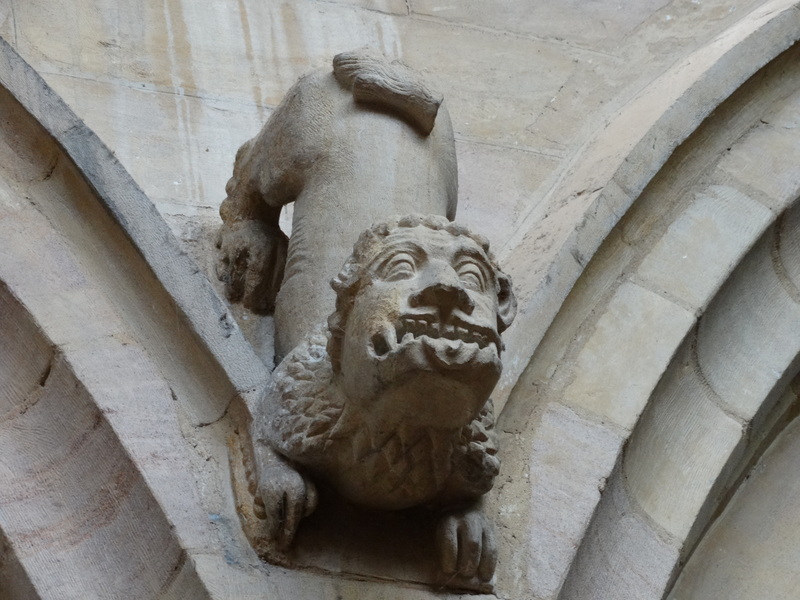 Countess Eleanor was his second wife – her feet rest on a griffon. 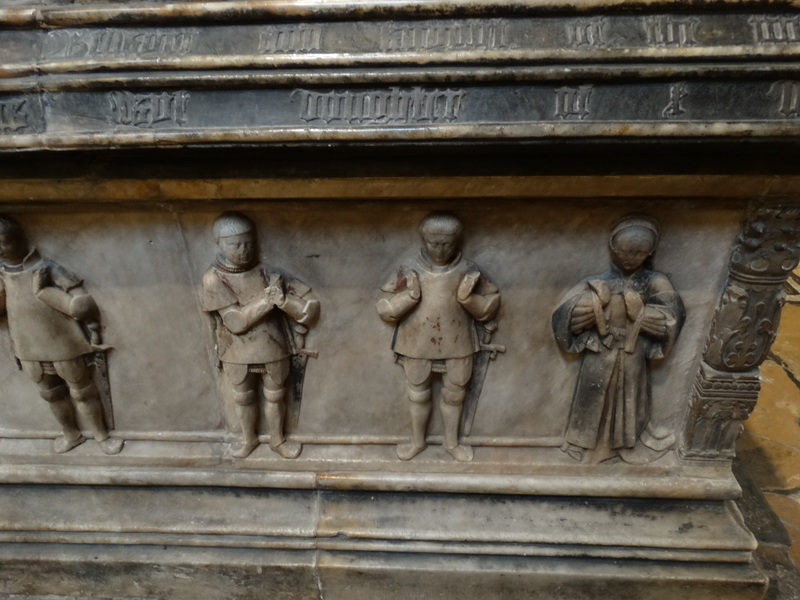 On the base of the tomb are weepers, sometimes thought to be children of the family. 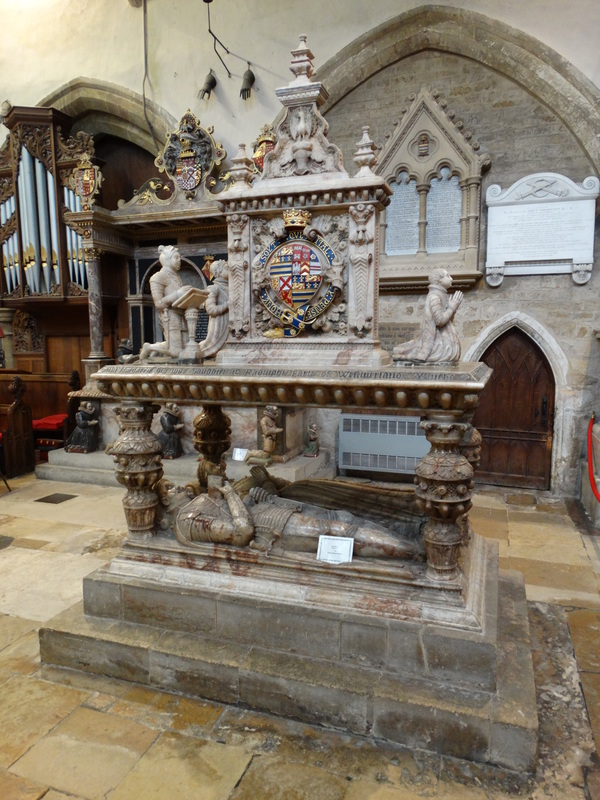 The tomb was created by Richard Parker of Burton on Trent, with John Lupton (rough mason) and his father. 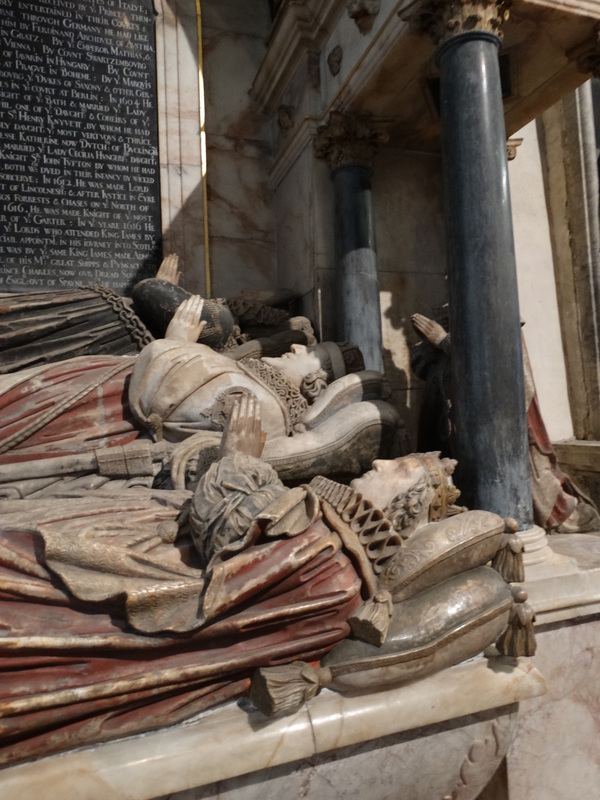 The body was embalmed with spices from Nottingham and encased in wax. A plumber then encased it in a close fitting leaden shell. 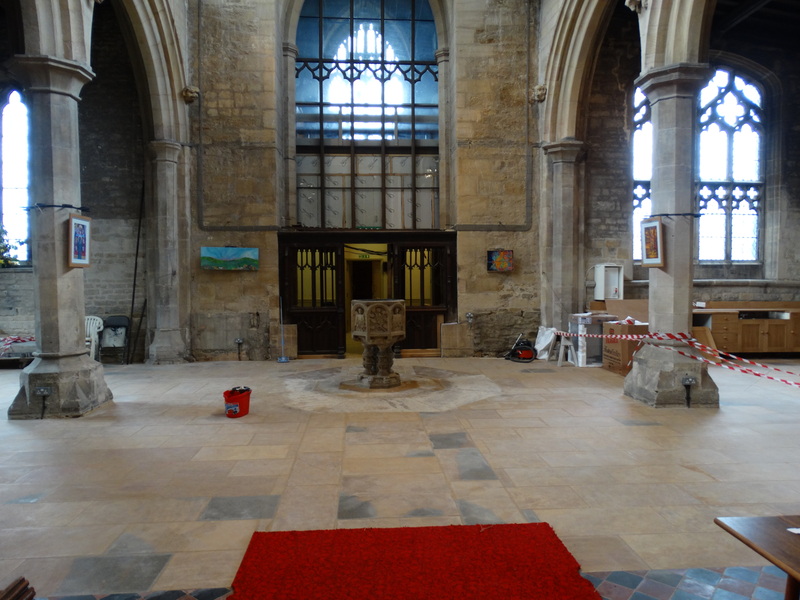 Masons also had to strengthen the Chancel floor. A lot of work! 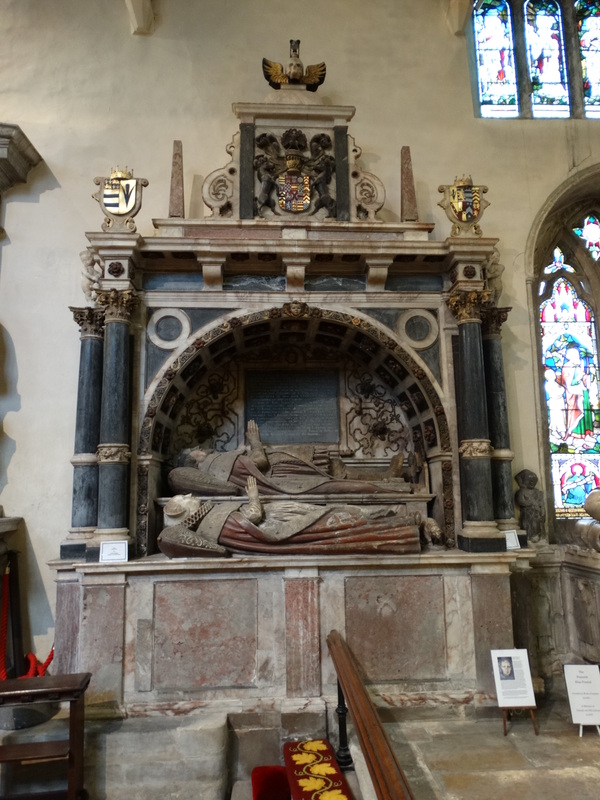 Central in the chancel is this tomb, Henry Manners, 2nd Earl of Rutland, died in 1563, and Countess Margaret, died 1560. 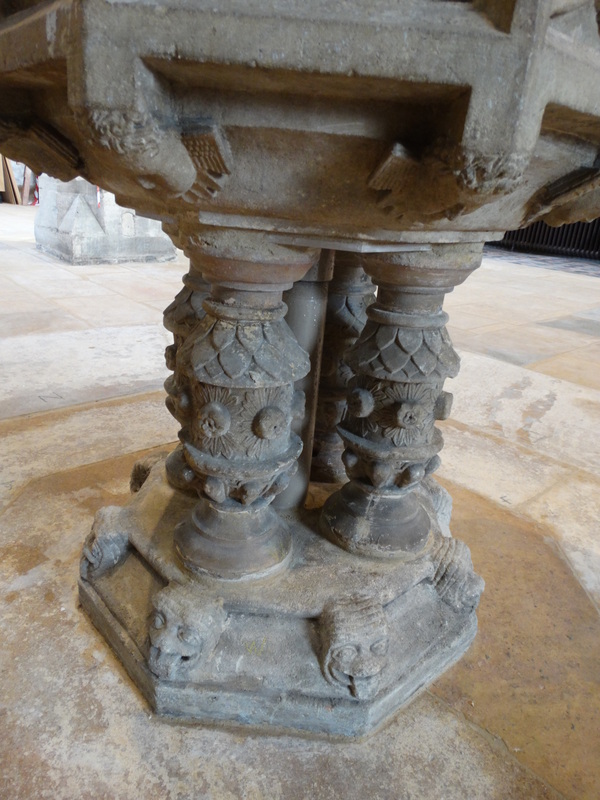 The decorated table supported on heavy carved legs, representing a communion table. He wears a coronet, the George collar is shown with its great chain nearly reaching to his thighs, and his Garter is on the left leg. He has a closed book in his right hand and the sword in his left. His wife wears a coronet and is dressed in an ermine-trimmed mantle. 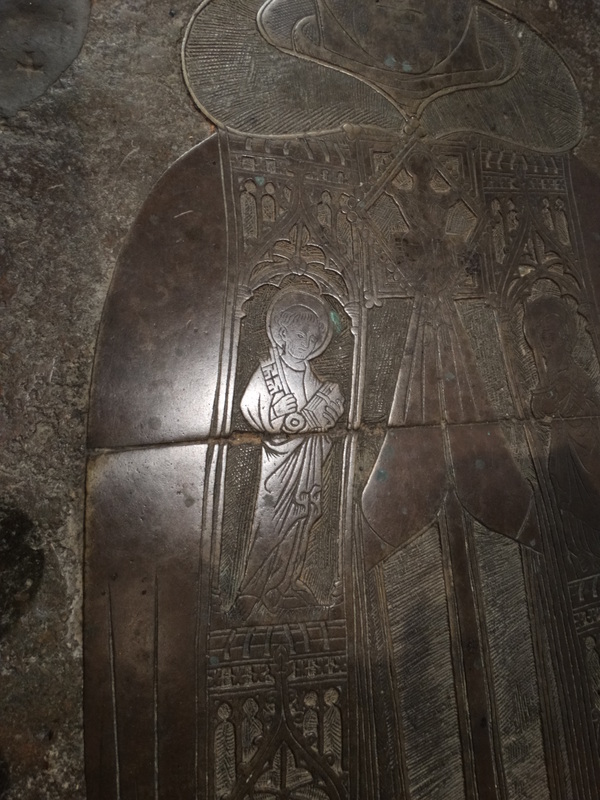 The three kneeling figures are their children – Edward, Elizabeth and John. 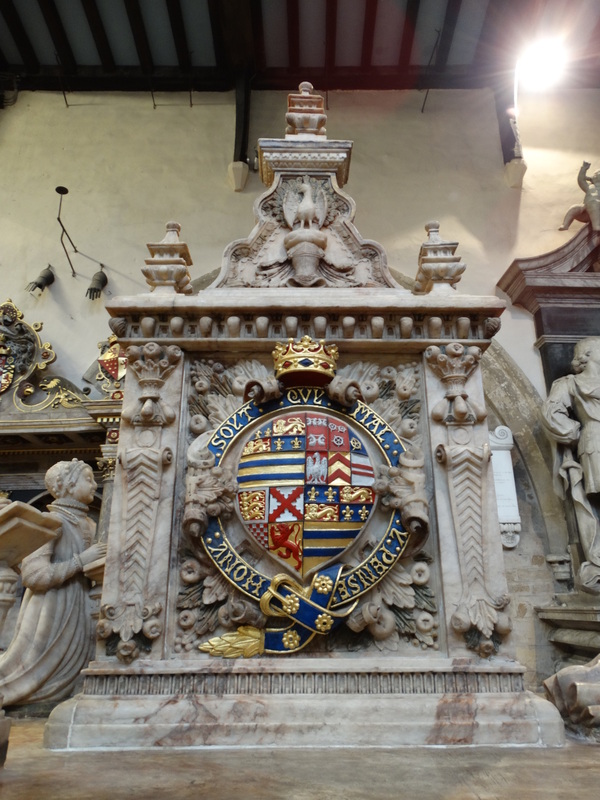 The double-sided coat of arms, on the north side shows Neville quartered by England and Creon, the south combines family lines to 1563. 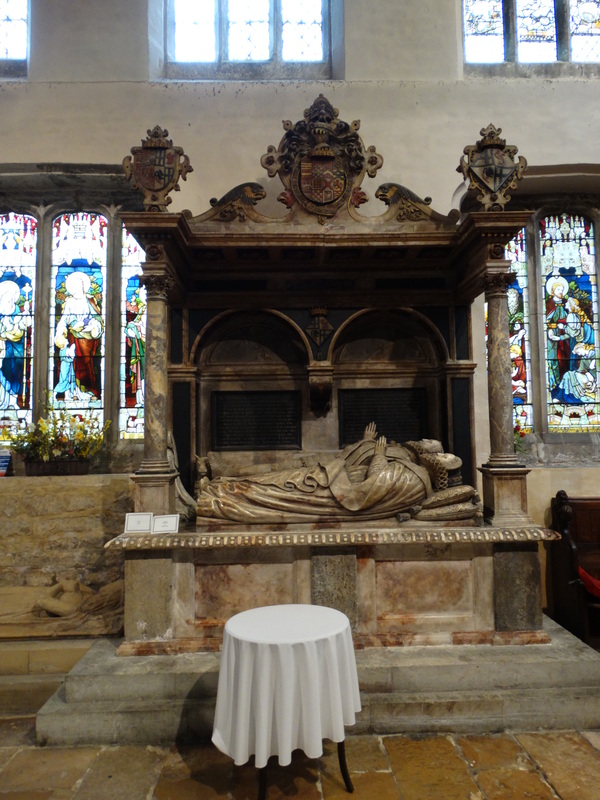 I think that the tomb below is Edward Manners, 3rd Earl of Rutland, died 1587, and Countess Isabel. It is by the Flemish craftsman Gerald Johanssen (Johnson) of Southwark. 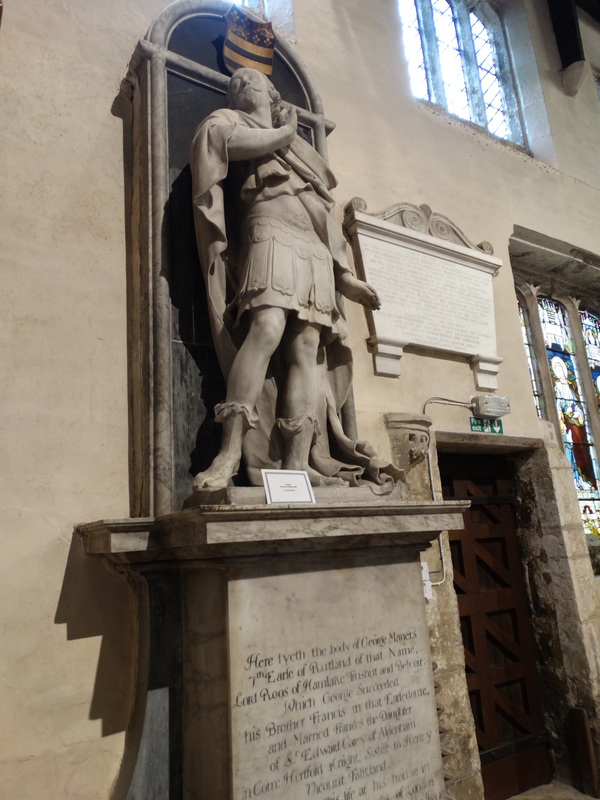 Earl Edward, who died on Good Friday 14 April 1587 at Puddle Wharf in London. He was bought home for burial on 11 May. He wears the mantle of the Order of the Garter. According to the guidebook: “His wife wears a ruff with the usual dress of the time” (“Darling, which dress are you wearing?” “Oh, this is just my usual dress”). 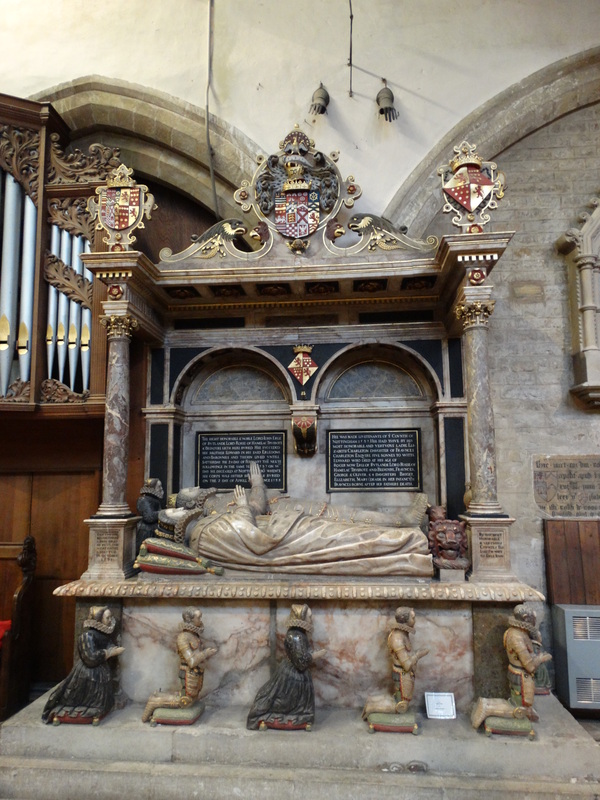 Her only daughter, Elizabeth, who kneels at her feet, married William Cecil when only 13, bore him a child, and died at 15. I looked at her alabaster form and had a tear in my eye. Edward’s brother was John, the 4th Earl, and he was married to Countess Elizabeth. 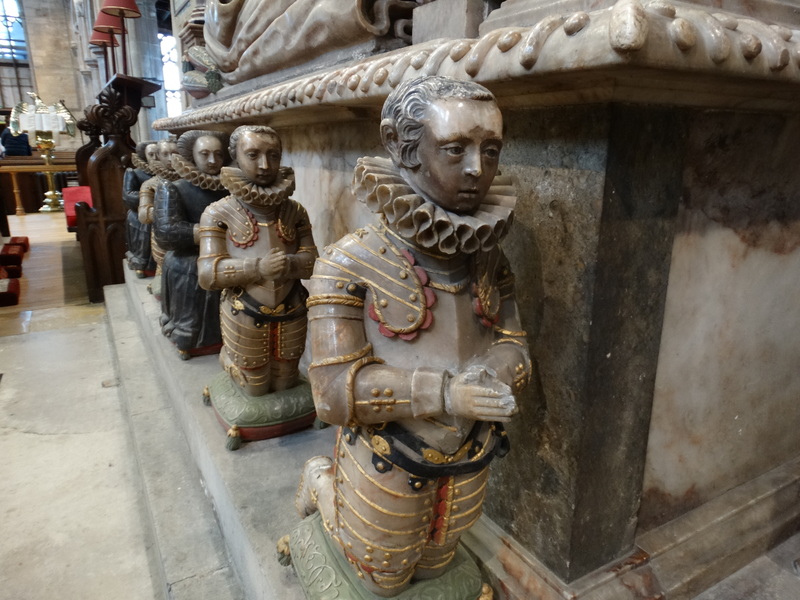 John died in 1588, and his tomb was also made by Gerard Johanssen in 1591 – John died only 10 months after his brother. They had had nine children, two of whom died in infancy. They too are remembered. 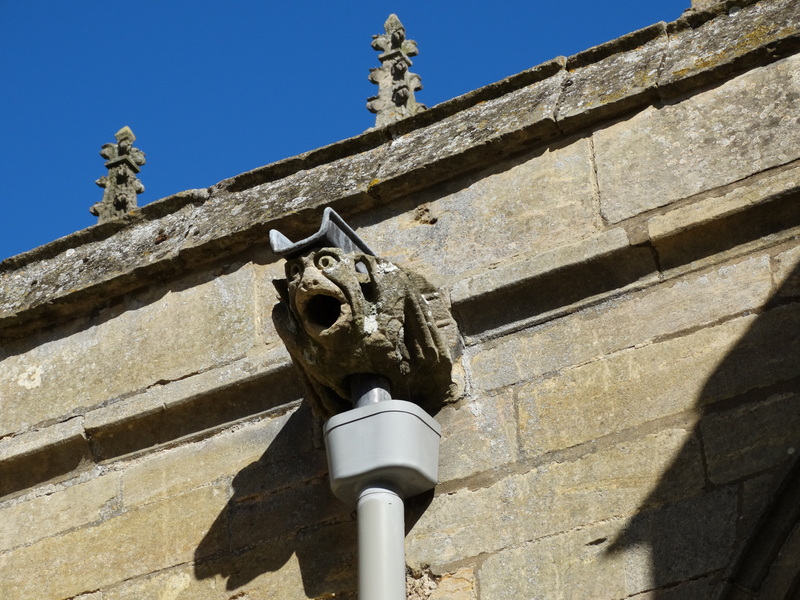 This next one is on the north side of the Chancel. 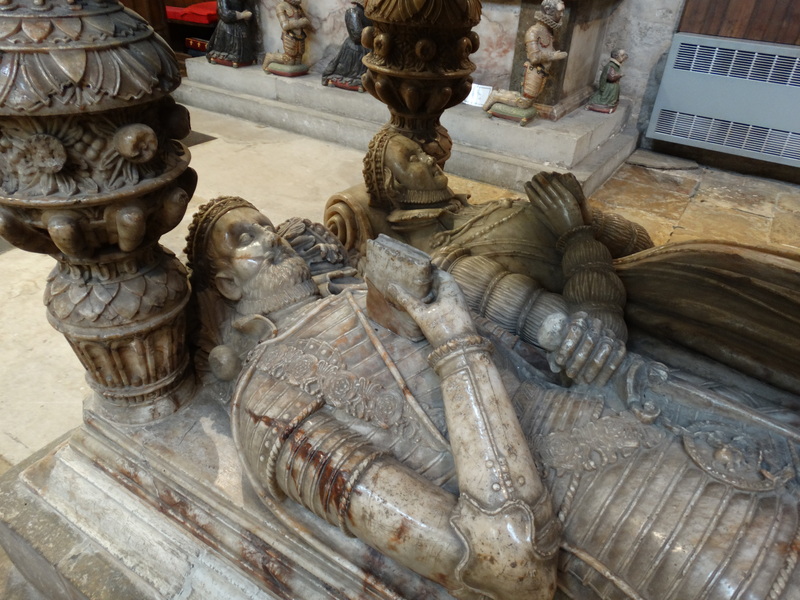 It is Roger Manners, 5th Earl, died 1612, and his wife Countess Elizabeth who died the same year. It is the work of Nicholas, son of Gerald Johanssen, and cost £150, which included carriage by sea from London to Boston. How on earth did they pack it, and convey it safely from Boston to Bottesford? Elizabeth was the daughter of Sir Philip Sidney, and was reputedly very beautiful. 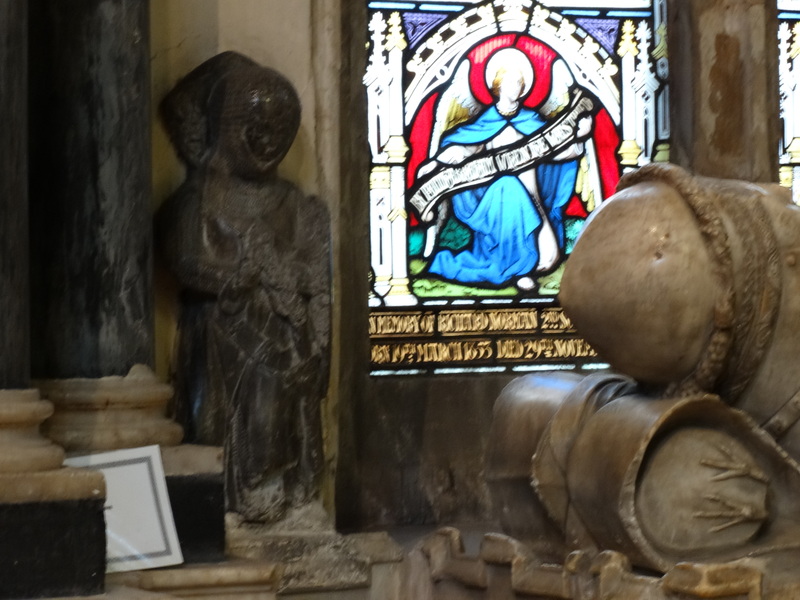 The guidebook says that at Roger’s funeral were 203 retainers and servants, 9 clergy and 27 cooks. The herald’s fees (just one herald?) 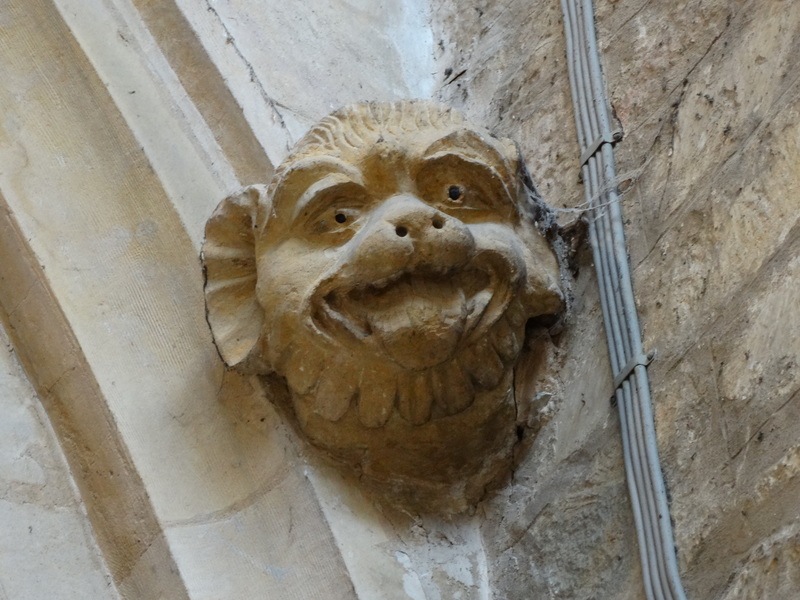 was £145, and Southwell Minster choir got £20. 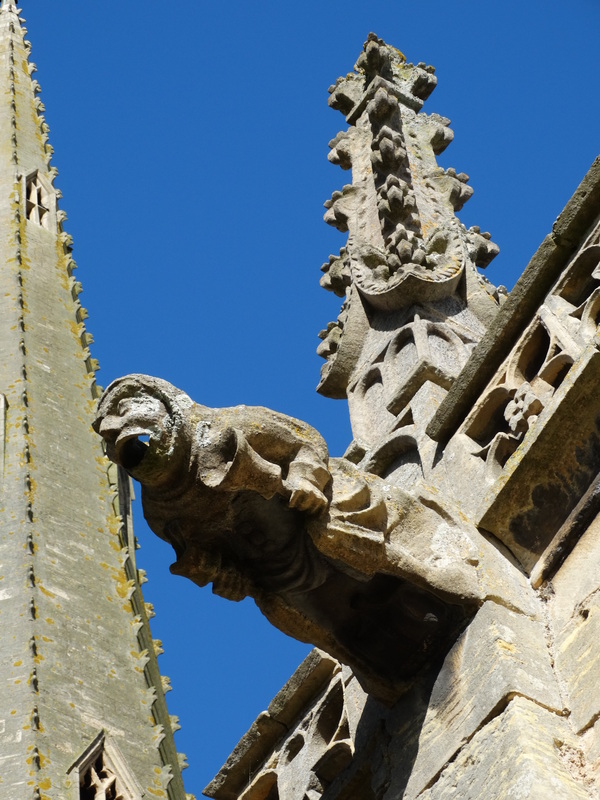 The bell ringers got 16 shillings, and it cost £20 to embalm him. Are you bored of monuments yet? You, dear reader, must agree that these are all rather something. 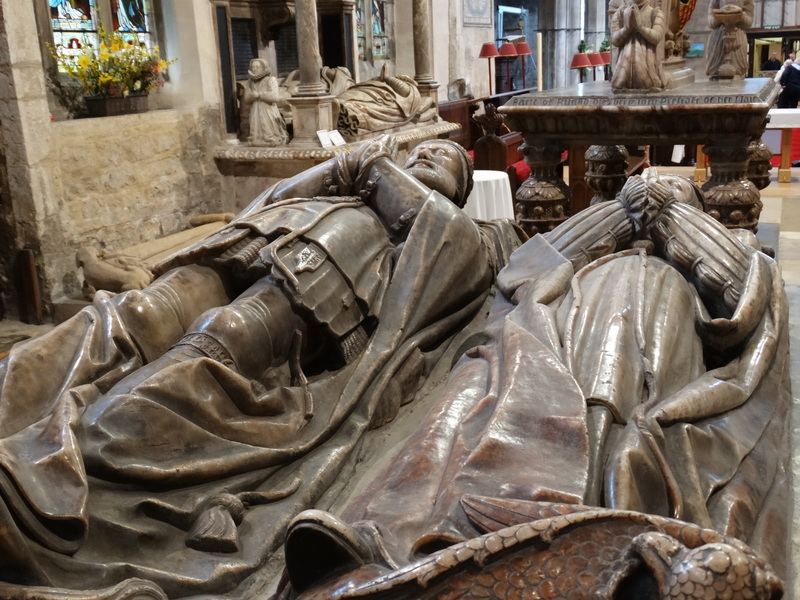 This is Francis Manners, 6th Earl, who rests for eternity between Countess Frances on his right, and Countess Cecilia on his left. The inscription tells of the hospitality Francis received from European princes during his travels – he was one of the party when Prince Charles (later Charles I) went to Madrid in an unsuccessful bid to marry the Infanta of Spain. 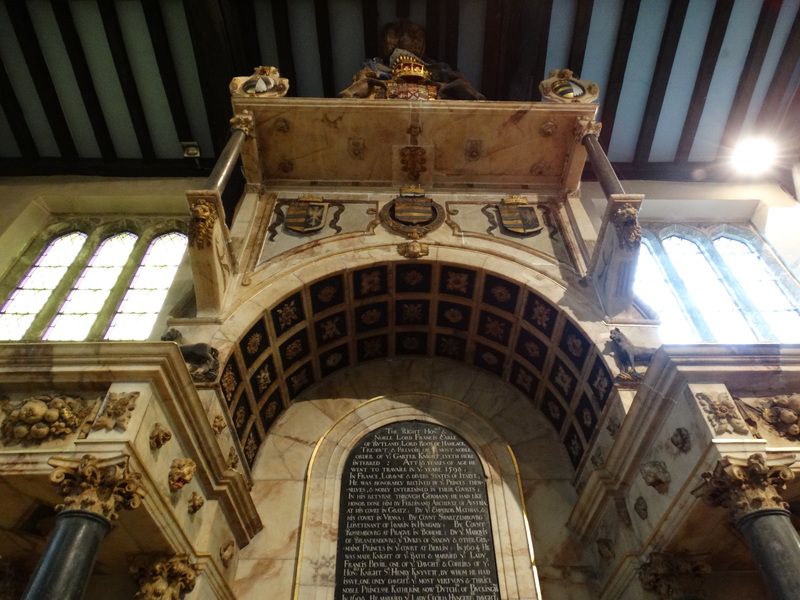 It also includes the line “In 1608 he married Lady Cecilia Hungerford … by whom he had two sons, both who died in their infancy by wicked practice and sorcerye”. 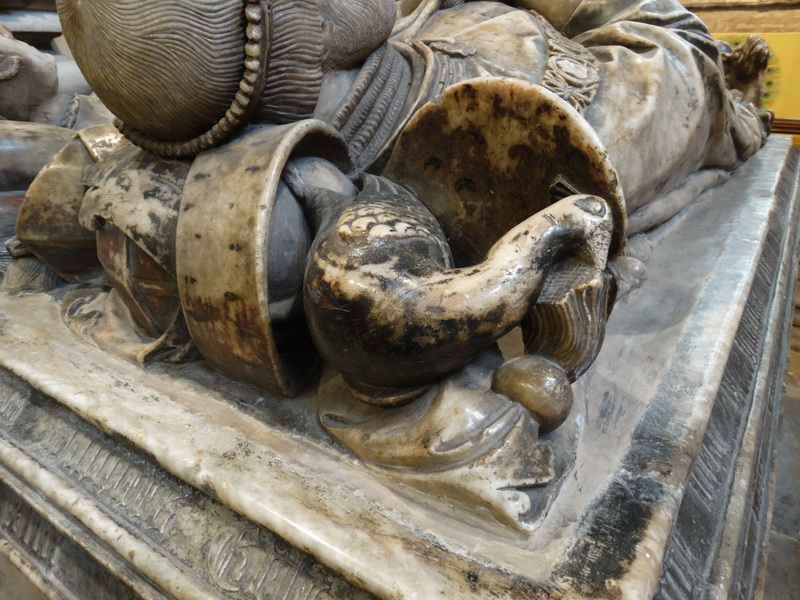 George Manners, 7th Earl, who died in 1641 has a white marble effigy (below, left) with him dressed as a Roman. His wife Frances is not pictured. 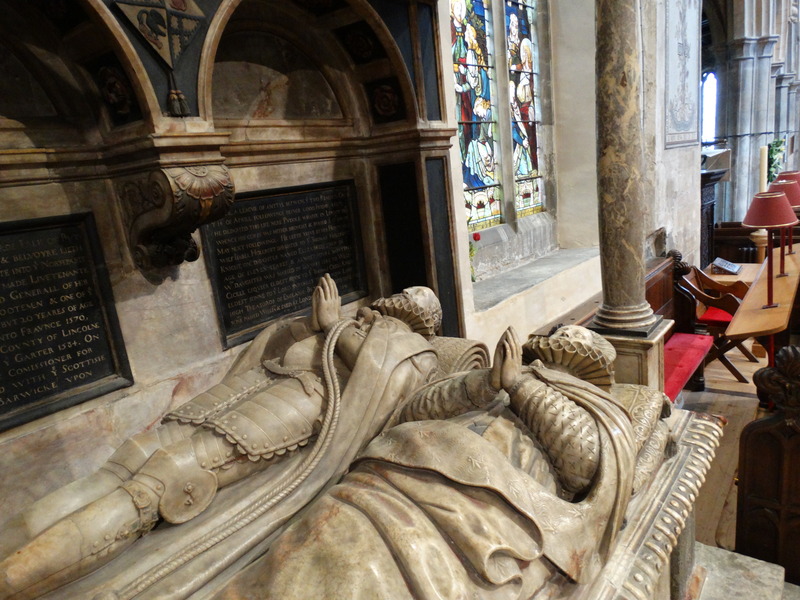 Our final aristocratic memorial (below right) is of John Manners, 8th Earl, and his wife Frances. 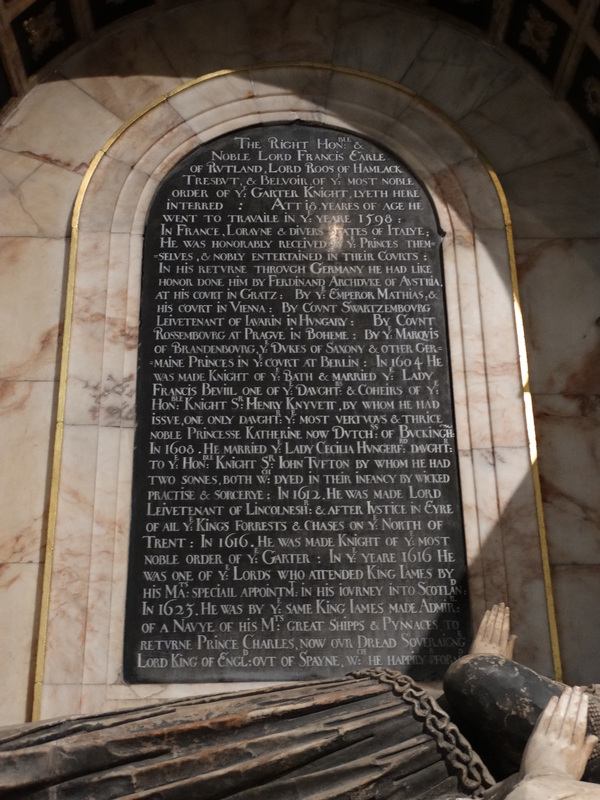 He died in 1679, his wife in 1671. 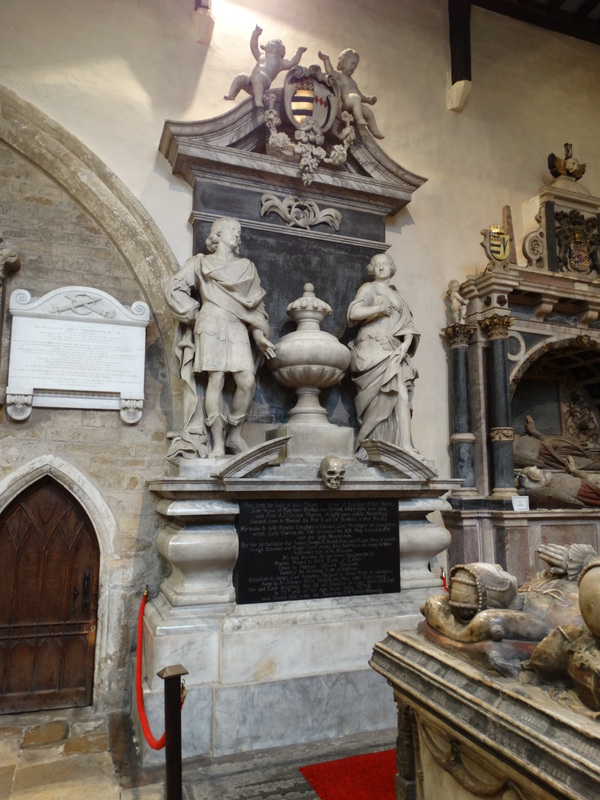 It is probably that both these memorials were erected in 1686 – there is a receipt in the Belvoir Castle accounts for £100 paid to Grinling Gibbons. Lots and lots of aristocrats, so let’s not forget a priest. 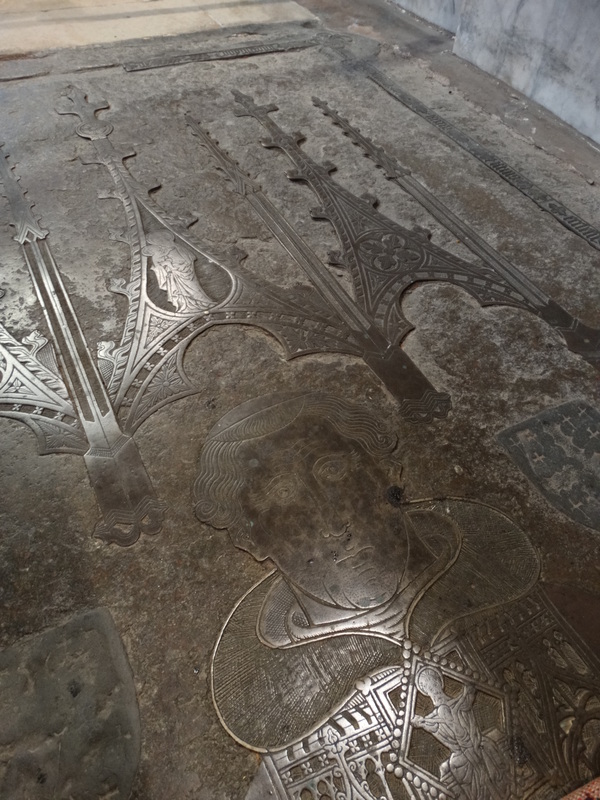 This brass commemorates Henry de Codyngtoun, Rector of Bottesford, who died in 1404. 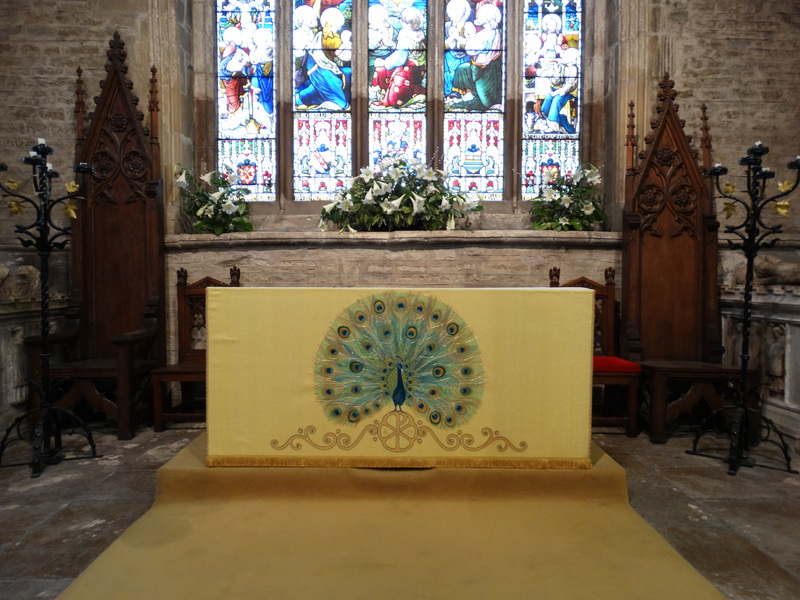 The embroidery on the cope is beautiful – spot the saints. 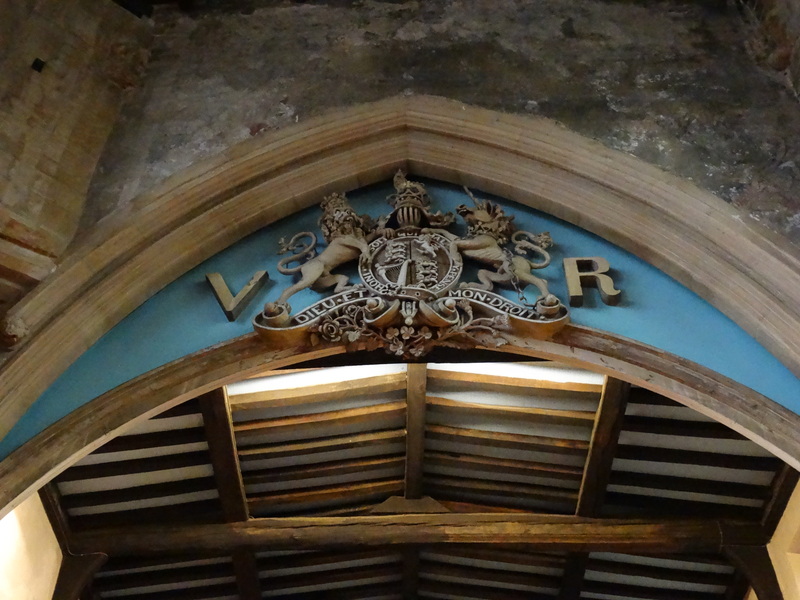 There is a VR Coat of Arms over the Chancel arch, carved in elm and plaster by William Tomline. It was erected in 1843 to commemorate the Queen’s accession and her visit to Belvoir Castle “during which a royal visit to worship in the church was anticipated” says the guidebook. Did she worship? 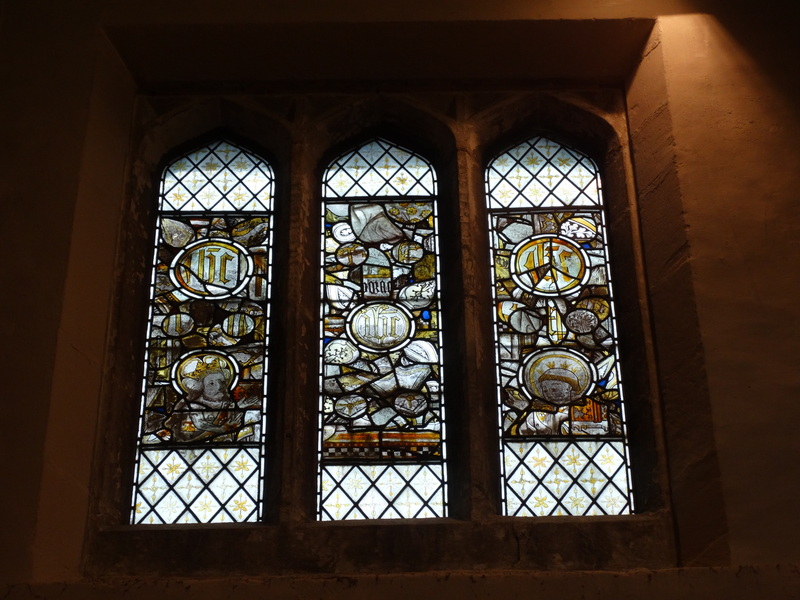 Some nice stained glass, but just two windows for the blog. 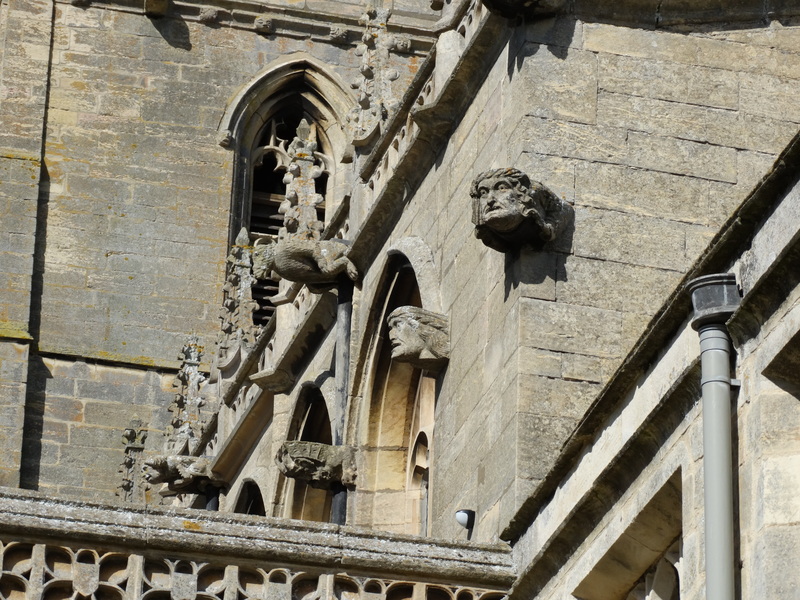 This one has Edward the Confessor (left) and Leofric, first Bishop of Exeter (right). 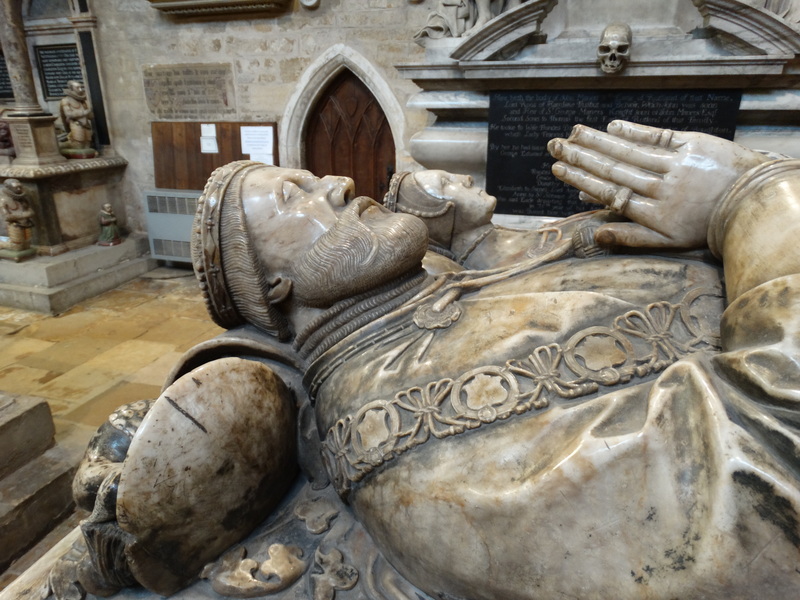 This figure is Richard Norman, the second son of Canon Frederick and Lady Adeliza Norman, who died in 1874. It is a window by William Wailes of Newcastle upon Tyne. The final memorial, probably a good place to end our explore of this wonderful church. 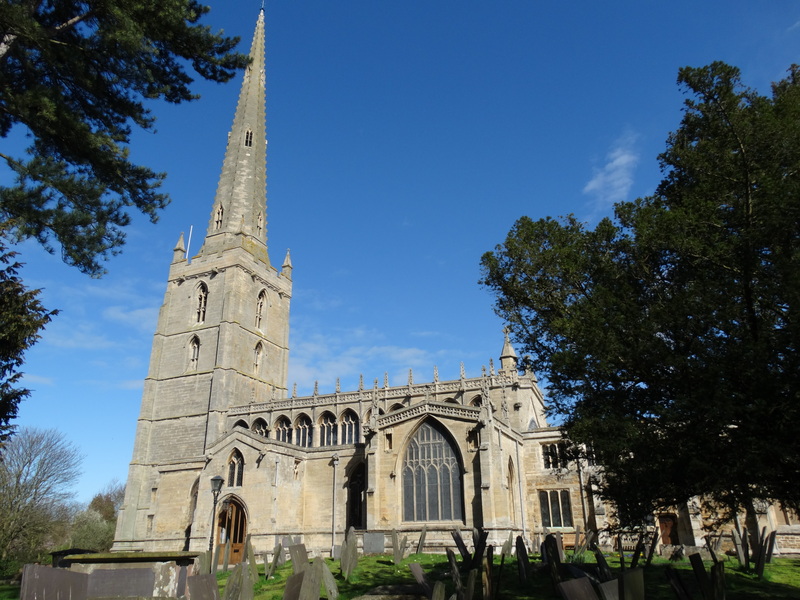 RAF Bottesford was just down the road, so there was a red light on top of the spire to stop planes hitting it. 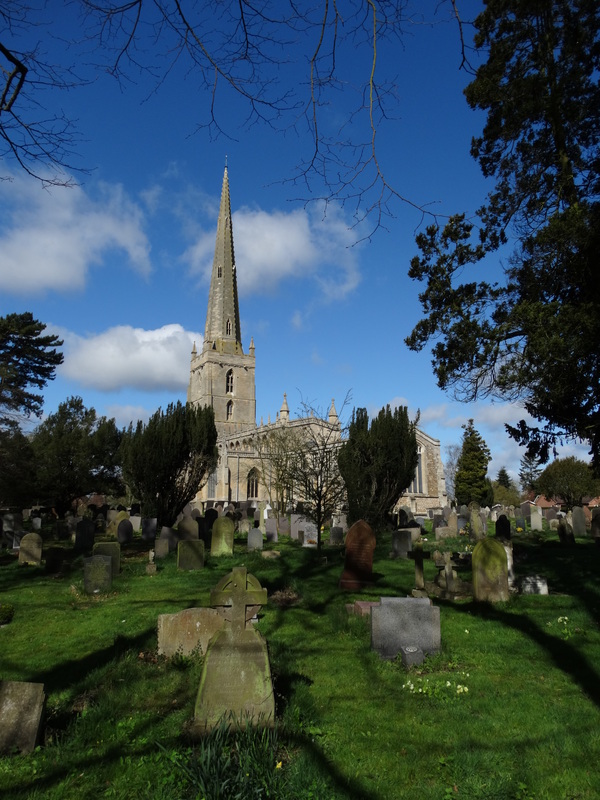 The spire was the last place to be attacked by enemy aircraft, on 20 March 1945 – fortunately without damage. 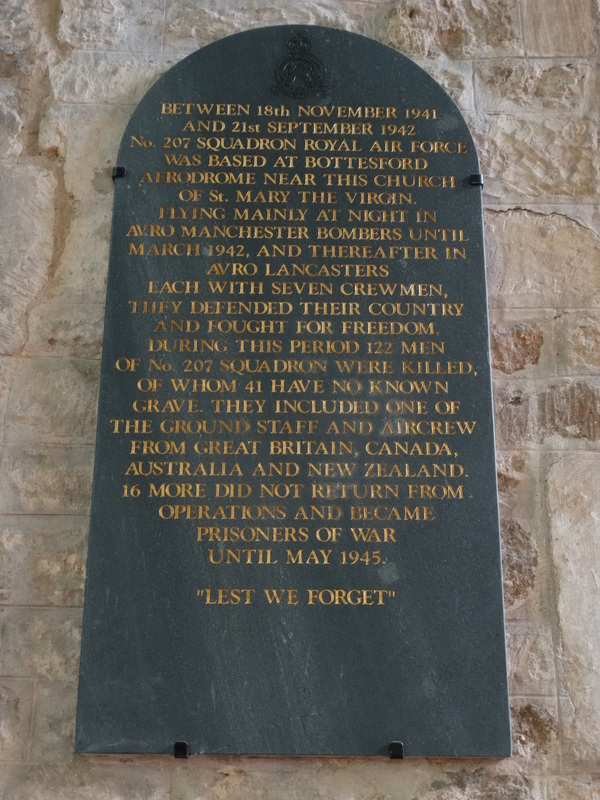 I walked round the outside of the church, and found some graves of airmen who died in the Second World War. 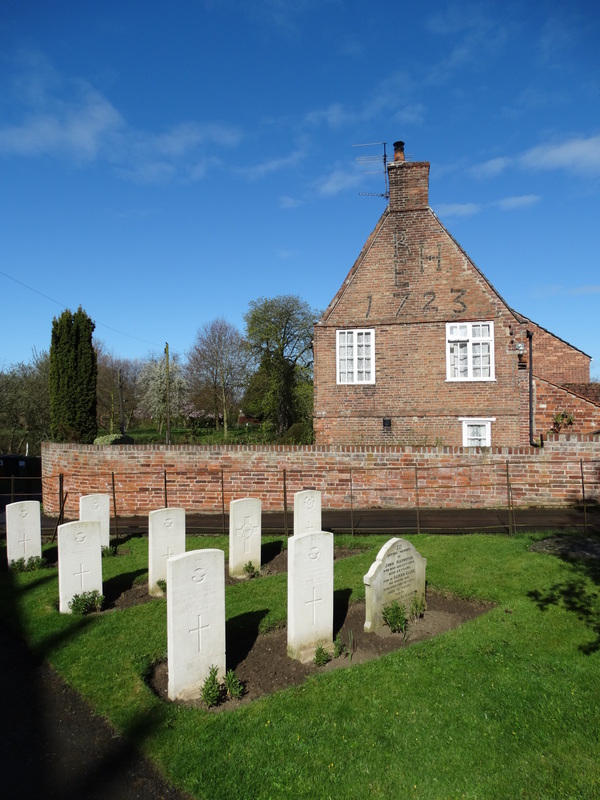 It seems almost wrong to draw your attention to the beautiful house behind them – but I suppose it is one of the things they were fighting for. 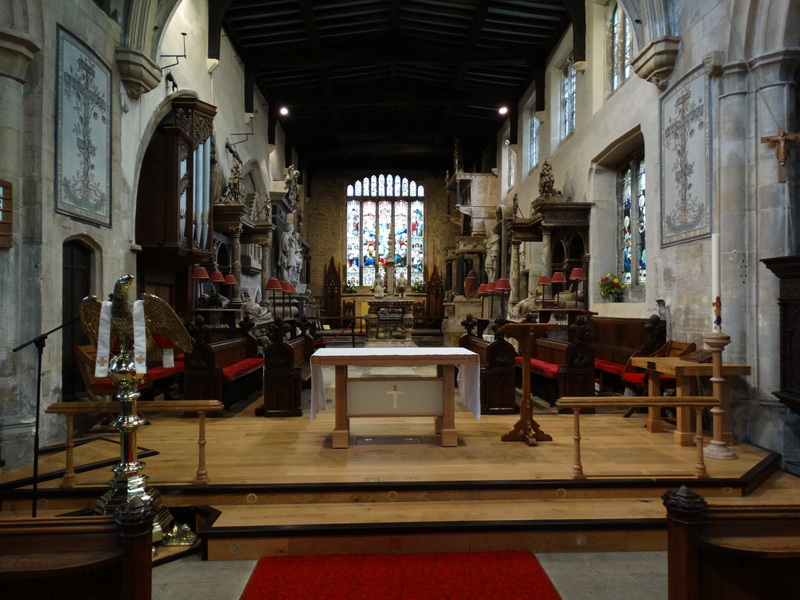 I had really enjoyed my visit to this beautiful church. Do go and visit. This entry was posted in Leicestershire, Outside Northumberland. Bookmark the permalink.